Our organization is flat and project driven with expert developers having between 10 and 20 years of experience and applications engineers that could understand customer needs, specify new functions and prototype them. Each employee is free to schedule his work as he/she wants except when operating at customer site in which case we stick to the customers HR rules. Performance measure is based on projects success, cost and delay. We are now very happy with the way everyone contributes to the company success and this is based on a Steewardship and responsible behavior everyday, which is a baseline for our recruitments. The team is based in Versailles and Saint-Petersbourg which is possible through our use of Skype and ALM tools since the very beginning of KI. From the very beginning, Knowledge Inside had a high focus on innovation and research and we kept concentrating on the improvement of our technology. We have been involved and are involved in many research projects and research activities, both on our core technology and its applications in various fields. For instance, we have applied our technology to develop our own CRM system and some of our tools (e.g. Model Gateway) are build upon our arKItect platform. We rely mainly on our partners for developing Sales and Services. 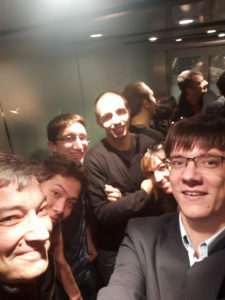 Knowledge Inside story started in 1996 with the involvment of the founders in a project between Aerospatial (now part of AIRBUS), RENAULT, PSA, Siemens, Valeo and research labs to define tools and methods for embedded systems design with a focus on automotive industry. In 2005, the project was stopped and the prototype was to become a specification for future implementation in a PLM. Convinced with the market need for system design and management tools, six people in the team decided to create a start-up and continue innovation. The idea was to develop a generic tool, well founded, flexible and intuitive for engineers. The former prototype had 500 predefined views; our idea was to create a flexible platform based on 3 simple patterns that would allow to defining Meta-Models in order to create custom views based on engineering data and needs. 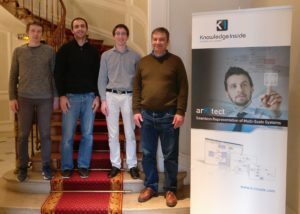 Knowledge Inside was created in 2006 when the team members still had a regular job in big companies. We started growing by selling consulting services around the first version of arKItect mid 2007 with the help of business angels and government funding. RENAULT and CHEUVREUX became customers in 2008 and BOUYGUES (Civil Engineering) in 2009. At the time we had about 700 K€ turnover and we had the opportunity to develop and tune the product with industrial customers that expected immediate results. In 2010 and 2011, we raised more than 1 M€ in order to become a software editor. We had 7 customers in 2011 including PSA, Ansaldo STS, EADS, Thalès (satellites), and 14 customers in 2012 including our first customer in Germany, EDF and Schneider Electric. With our involvement in systems of systems, and complex projects management, we understood progressively our technology could fit with any kind of systems modelling or design and data sets of high complexity.